Away from my Fiverr Pro I received an interesting request from an ex-student and follower. She requested a family portrait in a caricature mode, which isn’t that uncommon. However, the difference is that she wanted all the members to be dressed in Star Wars costumes. So, the challenge was on, to achieve something that was out of this world, or at least from a galaxy far, far away. The outline of the brief was a simple one. 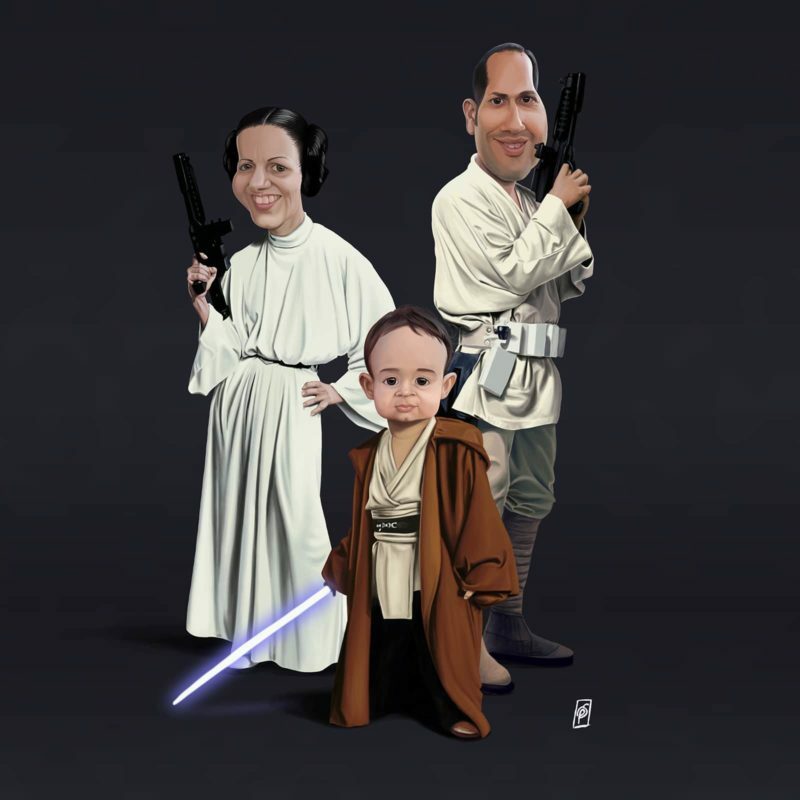 To represent the family in a group caricature portrait in the guises of Star Wars characters.. The original concept from the client was to have some more interesting character set-ups for the theatre of the characters, but after some discussion, I convinced her that the two adult characters should be that of Leia and Luke from the original film; A New Hope. This would play into the idea that they were in love, as the two were in the film. Once that was decided the only one left was to be the young son. It seemed obvious, when having these two as main characters, to have a young Ben Obi-Wan Kenobi in the image as well. This would also allow for a light sabre to be rendered in. So, after some research and sketching the characters were drawn out. The main concern, which was more about the light sabre looking effective, was the colour of the background. I decided to give it a grey studio background look, like they were in a photo call. This helped with the glow in the light sabre and the contrast of the two main characters who were wearing off white colours. If you are interested in any other of my time-lapse render videos, you can find it here!